Cite the VisualDx topic as a chapter in an electronic book titled VisualDx with editor Lowell A. Goldsmith. There are no page numbers, and publication year should be the current year. Papier A, Craft N, Tharp MD, Shear N. Cocaine Levamisole Toxicity. In: Goldsmith LA, ed. VisualDx. Rochester, NY: VisualDx; 2013. 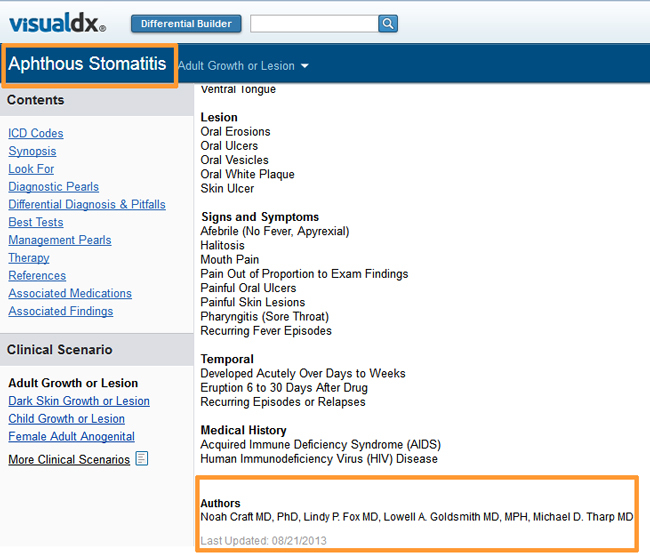 URL: http://www.visualdx.com/visualdx/visualdx6/getDiagnosisText.do?moduleId=14&diagnosisId=54687&view=text. Accessed October 29, 2013. The VisualDX corporate recommendation does not necessarily follow the citation style guidelines that you may need for your class assignments or for publication of a manuscript or book. For example, if using APA we recommend you modify your citation according to these guidelines. The APA's Publication Manual, 6th Edition should be consulted first in all matters concerning APA Style®. Author, A. A., & Author, B. B. (Year of publication). Title of chapter. In A. A. Editor & B. B. Editor (Eds. ), Title of book (pages of chapter). Location: Publisher. For more information, the rules for citing editors are listed in Section 6.27 Author and Editor Information of the APA's Publication Manual, 6th Edition. Note: The Purdue OWL site also states that in the case of electronic books, "If the work is not directly available online or must be purchased, use "Available from," rather than "Retrieved from", and point readers to where they can find it. For books available in print form and electronic form, include the publish date in parentheses after the author's name." Since UptoDate is a licensed resource, not available to the general public, the library example reflects this recommendation.